I was reminded by this post on Skip to My Lou recently that I really wanted to try making felt food, and it seemed like it would make a gift for a few kids I know who are about to become big siblings, so I decided to jump in and try making some. I had so much fun, it really is pretty addictive! I used the new bundle of beautiful wool felt that I won from A Child's Dream Come True in the Felt Week giveaway on Stumbles and Stitches (and some other wool felt from my stash), and a bevy of great ideas and tutorials from around the internet (although I confess, I often just looked at the patterns to get the general idea, rather than following them exactly). I mostly made fruit; the orange slices pattern (which I also used for the lemon) and the strawberry pattern are among many great patterns on Helping Little Hands. The pear pattern is from here (although I also added a stem), and my watermelon is similar to this one but I added the light pink and light green edges, drew my own shape, and omitted the cardboard (I find the idea of adding cardboard to a softie kind of weird, although it definitely gives the shapes more definition). 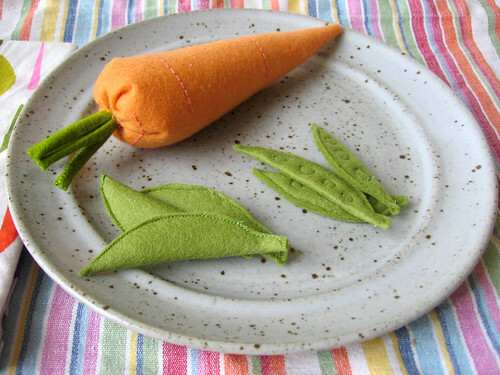 I also made a few veggies - the carrot is inspired by/similar to the pattern in Big Little Felt Universe, which I sadly do not own but have perused a bit. The peapods are my own design, and are really pretty basic to make, but I may go ahead and post a pattern for them later this week in case anyone would like instructions to make them. 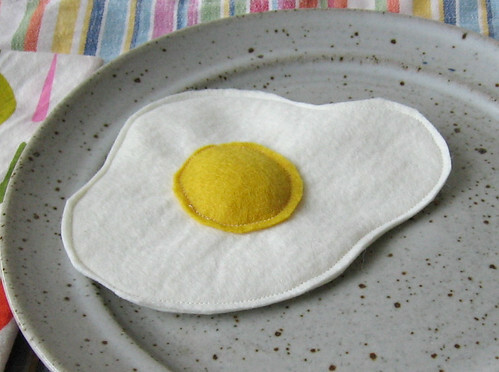 I didn't refer to a particular pattern for the egg - I have seen them in a number of places - but the way I did it was fairly similar to this tutorial, except that I sewed all the way around the yolk and then cut a slit in the top layer of white to stuff it from the back (and sewed it back up) before sewing together the two layers of whites. But actually the way they do it in the tutorial is probably a better and easier method. 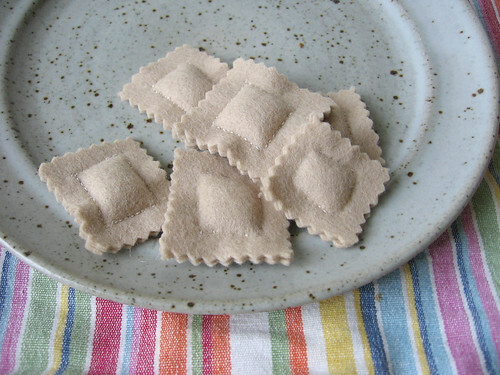 I don't remember where I saw the ravioli, but there is a pattern here - it is pretty intuitive how you make them. As you may be able to tell from the photos, I did a mixture of hand and machine sewing on these. I like the look of the hand embroidered details and it is a good project to do while watching a movie/tv, but much of the sewing can also be done by machine if you want to make them faster. and I am sure there are more! 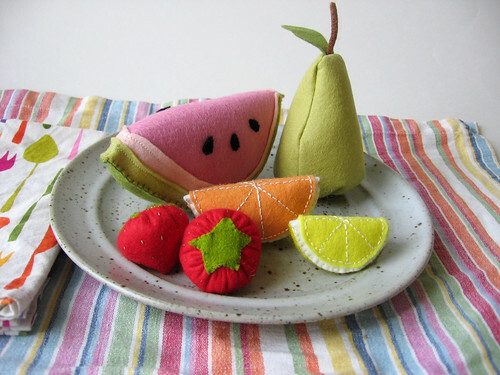 If you are looking for patterns for felt food, I also found that fairyfox had a number of good tutorials posted, and the Olsen Family Journal had a good list of links. 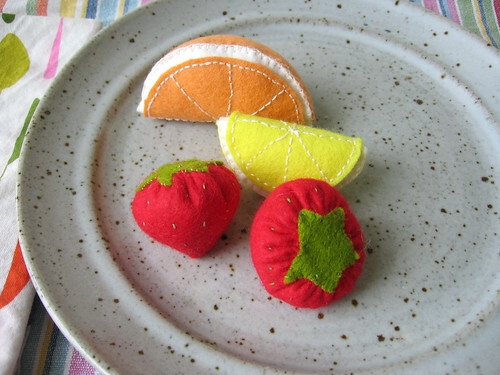 Have you ever made felt food? What were your favorite things you made? So darn cute!!!! What a fantastic idea! These are so cute. I can see them in a designer home kitchen display. Really cute! Love how these turned out! Thanks for linking. These look fantastic-what a great idea! What a cute little project, and an awesome gift! I need to add this to my summer to do list - my girls would love making food like this! Wow - amazing! What fun foodie goodies! These are great and I love how pretty they look with the natural wool felt. Fantastic job!! These look great! The colors of the felt are just amazing, thanks for sharing!